Ok i know this has nothing to do with 3-d movies but I found this video on youtube and it’s freaking awesome. It’s a video production company that does provides an explainer video service. If you’re not familiar at all with these types of videos basically they are animated promotional vids that help explain a companies product or service. Explain It Videos does a great job on showcasing the creativity and why you should choose these guys for any type of animated promo video. The video starts off just like every other boring video until things get crazy and people start getting eaten alive. Limbs being pulled off, blood splattering effects. Just kidding it’s not graphic at all but still cool. I think this is going to be the future of marketing and even now it’s getting pretty big. Think about everytime your in the app store or google play a lot of these apps have videos. What better way to engage a potential downloader then giving them a fun cartoon to look out. You can check out more explainer videos on the fb page too. So sorry this had nothing to do with my normal content but I saw this on youtube and loved it. Maybe it’s because i am an aspiring animator myself. Do you think the 3d era in television is dead? Well if you said yes, your wrong. It’s booming and doing well. People are clamoring for the new releases this year in 2015 and I will tell you why. There has never been a better time to go out and buy a 3d tv and get into this movement than now! With all the upcoming 3d movies on blu ray coming soon now is the time. If you want to wait that’s fine because there are also many great upcoming 3d movies coming soon to theaters in 2015. Fist off if you think that 3 D is dead you are wrong. I was like you once who felt 3d was just a gimmick and I didn’t even enjoy watching 3d movies on tv until now. I just recently purchased a 4k uhd 3d tv from LG. The 3d effects on this thing blew me away. I was instantly hooked. I bought several kids movies including the book of life 3d blu ray disc. The trick is to buying a good movie is you need to know which films have been converted to 3d and which were actually made for 3d. There is a night and day difference and the pop up effects are amazing to view if you picked the right one. Visit this site I have mentioned like several times and you will learn everything you need to know about upcoming releases on blue ray and the latest and hottest movies that were out this summer such as jurassic world 3d on blu ray. The first thing we all do when we get a new tv is test it out with blu ray movie. When it comes to 3d movies they can get rather expensive. They can easily be around 25-35 dollars per each 3d blu ray. As soon as you see one movie in 3d trust me your going to want more. Like me I started thinking of all the movies that would be great in 3d but didn’t have much money to buy them all. Lucky for me I found out how to download 3d movies for free. This guide saved me a bunch of money. I already had most of these movies on blu ray and the idea that I would have to buy these all over again didn’t seam like such a great idea. I actually stream these downloaded movies from my computer right onto my 3d tv. The quality looks just as good as a blu ray movie if you download larger files. If you don’t want to go the way of downloading 3d movies your best bet will be to 3d movies streaming. There are many more companies offering this type of service including netflix, vudu and 3dgo. 3d go is probably the largest selection of 3d movies on demand. So long live 3d as it will never die and I hope continue to be a larger demand. 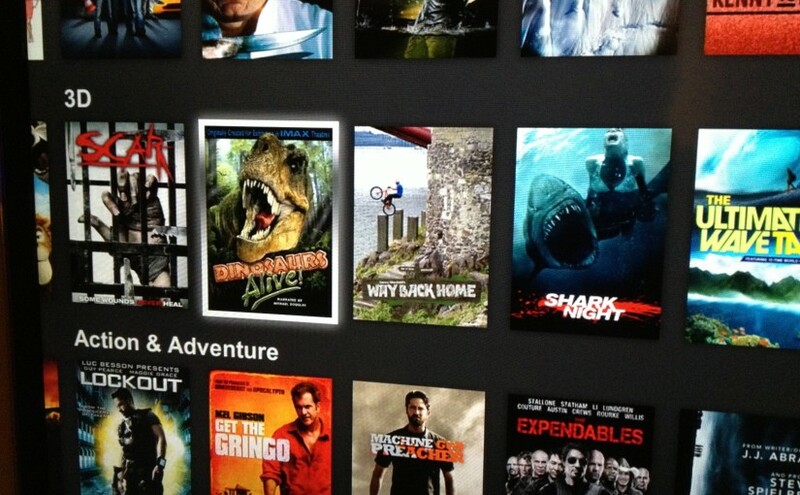 Now you can stream 3d movies on netflix instantly. The best thing about it is you don’t need a upgraded account on netflix either. All you need is a regular account and a 3d tv and you are all set. When I first bought my 3d tv just a couple months ago I didn’t even know netflix had 3d until I was browsing the library and I noticed certain movies with a silver 3-d tag next to the title. A good title to check out with the best 3d movies pop out effect is a turtles tale. I couldn’t believe how breath taking this movies was in 3d. The movie is complete crap but it looked so amazing I watch all the time with the kids. I really don’t understand how it’s possible because it’s being streamed but regardless definitely check this one out if you really want to see what your 3d tv can do. Despite what you heard 3d movies are on the rise and I expect more content to be available via stream. I know vudu and 3dgo have a lot of 3d movie content too but they are services you would have to pay separately.